Tanya Michaels, author of "Hers for the Weekend" and "His Valentine Surprise"
Ready for another visit to Cupid's Bow, Texas? 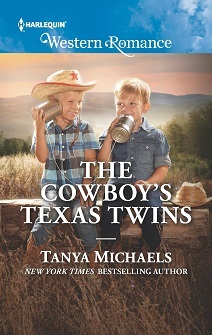 In THE COWBOY'S TEXAS TWINS, Grayson Cox reluctantly returns to his hometown after getting custody of his orphaned godsons. His own childhood in Cupid's Bow was rocky, but he can't exactly raise five-year-olds on the rodeo circuit. When he befriends town librarian and former classmate Hadley Lanier, he discovers that his welcome back to Cupid's Bow may be warmer than he expected. But before he can think about a future with Hadley or anyone else, he'll have to admit some hard truths about his past.